It wasn’t just food that was rationed during World War II. Clothes rationing began on 1st June 1941 as textile factories switched to war work, making parachutes and soldiers’ uniforms instead. 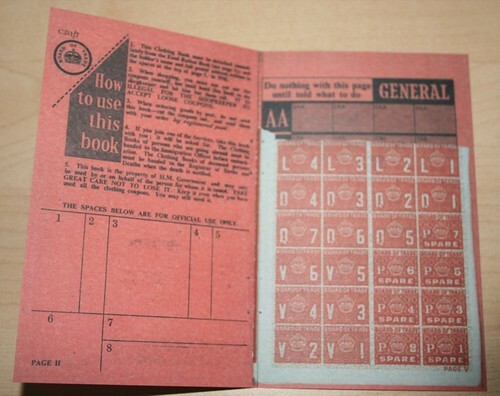 People were given a clothes ration book which gave them 60 coupons for a whole year and children an extra 10 to allow for growing. A woman’s woollen dress needed 11 coupons and shoes needed 5. A man’s three-piece suite needed 26 coupons. Each page of coupons in the book was a different colour to stop people using up all their coupons at once. As there was a short supply of stockings, many women drew seams with an eyebrow pencil down the back of each leg to give the appearance of wearing stockings. Other items rationed included: soap, washing powder, paper and furniture. 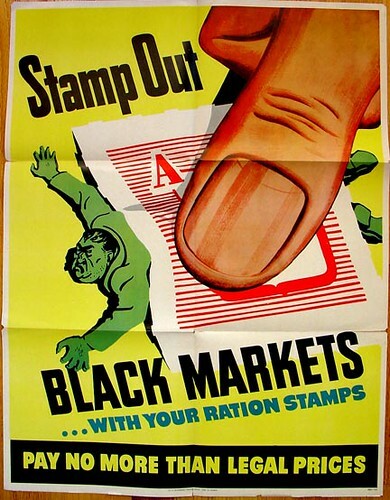 Coal rationing also began in July 1941 because more and more miners were being called up to serve in the armed forces and coal was becoming harder to get. ‘Black market’ dealers obtained rationed items and then sold them secretly. Many ‘blackmarketers’ became very rich but if they were caught they would be heavily fined or put in prison.